If you live locally to the above area and your dog needs exercise or socialising during the day why not take up our dog walking and dog socialisation service? 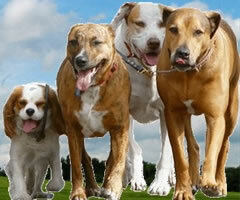 We offer a friendly, reliable service at £11 for a 1-hour group walk or £17 if your dog needs to be walked separately. We also charge £6 per extra dog from the same household. All dogs are walked off lead if the owners give written consent. We are experienced, fully insured and police checked. People think nothing of getting a child minder to look after their children, but forget about the poor dog stuck at home with nothing to do. As a qualified dog trainer I see many problems that can be related to boredom or depression. Dogs are active and need their natural instincts to be stimulated. They should not be left alone for more than 6 hours at a time or problems can occur such as, chewing, house soiling etc. We also offer a combined walking and training package (Gloucester area only). Or can visit your puppy to give lunch whilst teaching some valuable things like, ‘leave, wait, down, recall, walking nicely on the lead, approaching other dogs/humans respectfully’ and many more. Many dog walking companies are now offering basic training but please check they are qualified as most have no dog training experience and this can do more harm than good to your puppy in the long term. After each training session you will be given an update of your dogs progress and a briefing of how to continue the training when we are not there. Please see our price guide for further details. If you are looking for an established company that offers dog walking in Gloucester and surrounding areas please give us a call or text on 07730 612 452 and we can call you straight back. Dog walking Gloucester services provided from Monday to Friday.